With ice season in full swing here in North Carolina, I’ve been spending a lot of time sinking my picks into the frozen stuff at Whiteside Mountain. With fickle ice conditions in the Southeast, it can be hard to know when the ice is in. But with ice climbing beta so hard to come by, it can also be challenging to know where the ice is in. 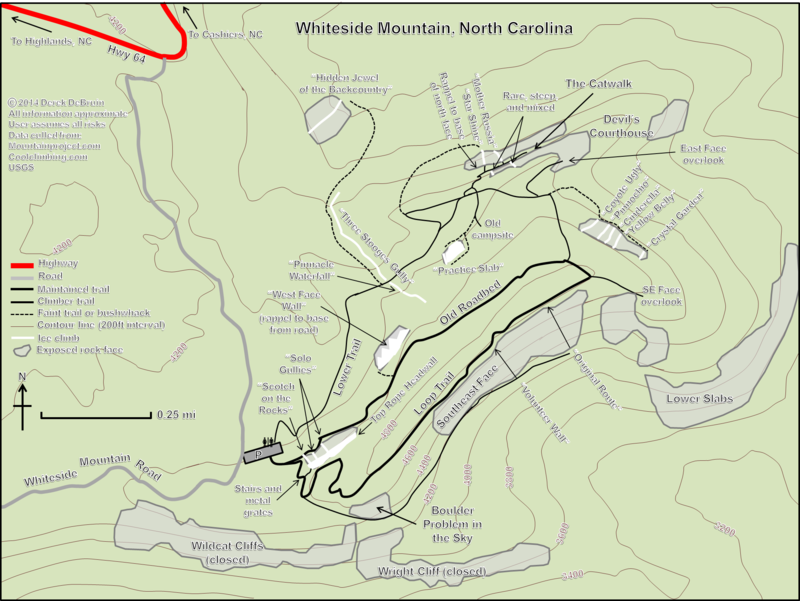 I thought I would rectify this by producing the first complete, publicly available topo map of Whiteside Mountain, NC, where the ice is frequently great and there is plenty of it to choose from. Single pitch or multipitch, moderate ice slabs or overhanging mixed projects–there’s a little bit of everything at Whitesides. If you’d like the personalized tour, book a day with one of our guides. Or, if you’ve got a handle on southern ice but would like to try your hand at some crystalline waterfalls a bit further afield, check out our full bevvy of ice climbing programs in New Hampshire.